Kitchen United on Monday announced the closing of a $10 million series A funding round led by Google Ventures, a move that will accelerate planned growth for the self-described “virtual restaurant concept." 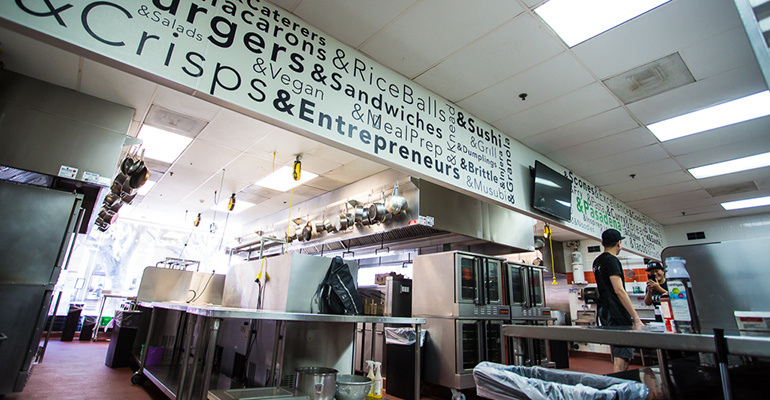 Launched in 2017, Kitchen United is a state-of-the-art commercial kitchen facility designed primarily to meet the needs of restaurant operators looking to build off-premise business. The shared facilities, for example, offer both kitchen space and infrastructure for restaurants to launch delivery-only concepts or to test their brand in new markets without making an investment in real estate. Also participating in the funding round are Kitchen United co-founders Harry Tsao and John Miller of the tech-focused Cali Group, below, which includes in its portfolio the Cali Burger chain and Miso Robotics, maker of the burger-flipping robotic arm called Flippy. Google Ventures, or GV, is the venture capital arm of Google parent Alphabet Inc., which has also invested in a wide range of other businesses, from Impossible Foods and Blue Bottle Coffee to Uber, Slack and DocuSign. 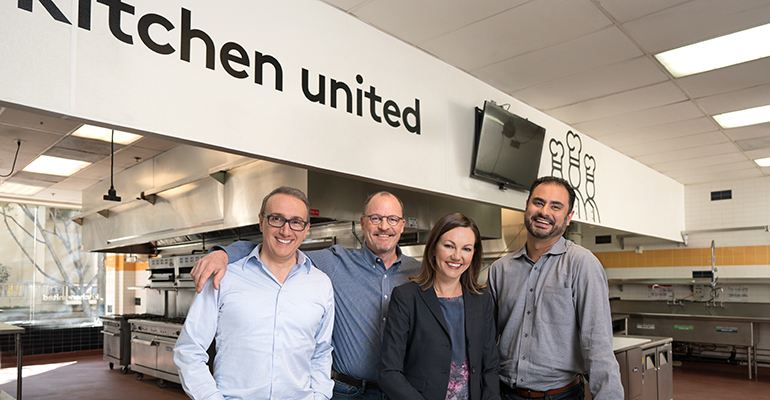 As part of the deal, Adam Ghobarah, GV general partner, will join Kitchen United’s board of directors. Jim Collins, Kitchen United CEO, said the investment will speed up the growth the company already had planned. By the end of 2019, new facilities are expected to open in West Los Angeles; Atlanta; Columbus, Ohio; Phoenix; Denver, Jersey City, N.J. and New York City. Which comes first will depend on construction timelines, Collins said. “West LA, Atlanta and Jersey City keep swapping for next position to be open,” he said. The first Kitchen United facility opened in Pasadena, Calif., earlier this year and now serves about seven restaurant concepts out of about 12,000-square feet. Going forward, Kitchen United locations will be bigger, designed to serve between 10 to 15 restaurant companies, depending on location. The company plans to move into converted warehouses, big box retail stores and light industrial areas in cities across the country. The iconic Los Angeles restaurant Canter’s Deli, for example, is offering delivery out of the Pasadena Kitchen United, as is The Lost Cuban, which has a brick-and-mortar location in Cedar Rapids, Iowa; and concepts like The Pizza Plant, which has no physical location yet, but several units in the works. Famous Dave’s is also looking at Kitchen United’s Southern California locations as the chain experiments with delivery-only, Collins said. The Pasadena Kitchen United has a limited street presence called the Commissary on Madison to allow guests to order for pickup. The facilities also rent short-term space to food entrepreneurs who need access to permitted kitchens. In addition to kitchen space, Kitchen United provides support services that allow restaurants to maximize efficiency, from refrigeration, storage and shared dishwashing to data that can help restaurant operators map demand, tailor labor and make the most of their menus. Collins said both Cali Group and GV bring a host of potential sister-brand partnerships to Kitchen United clients. Kitchen United is among a growing number of flexible kitchen facilities hoping to tap into the $35 billion food delivery market, which is expected to reach $365 billion by 2030. Competitors include CloudKitchens, which is reportedly being grown by City Storage Systems, of which former Uber CEO Travis Kalanick recently took a majority stake with a $150 million investment. Pilotworks is another shared-kitchen facility chain with four locations: Brooklyn, N.Y., Chicago, Dallas and Newark, N.J.